Apart from Dinosaur National Monument and the canyon of the Yampa River, northwest Colorado is not renowned for its natural scenery. North of the Colorado River and west of the Rockies, most of the land is roadless and uninhabited, consisting of innumerable shallow, steep-sided canyons between wooded mesas, becoming lower in elevation, less vegetated and more desert-like towards the border with Utah. 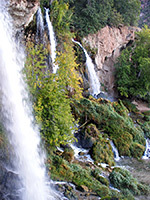 But there are several interesting sites in the hills around the small town of Rifle, 25 miles west of Glenwood Springs, and the best is an unusual triple waterfall in a limestone grotto, the highlight of Rifle Falls State Park. This small park also has a pleasant creekside campground, and while it only takes an hour or so to view the falls from all angles and explore the small caves in the surrounding limestone cliffs, many people camp for a few days and use the park as a base from which to explore the surrounding area - locations in the Rocky Mountains like Aspen and the Maroon Bells are just over an hours drive away, and a few other state parks are much closer. 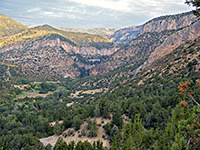 Although Rifle Falls lies at the edge of the largely undeveloped land that occupies most of this part of the state, the two approach roads cross agricultural country of ranches and scattered dwellings; the main route is from Rifle (interstate 70 exit 90), from where roads 13 and 325 head north, this latter passing through a narrow ravine in an otherwise unbroken escarpment (the Grand Hogback). 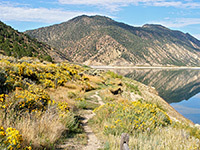 This breach is known as Rifle Gap, and damming of the stream (Rifle Creek) flowing through has created Rifle Gap Reservoir, also a state park, and quite a scenic place, offering good access to the open, grassy shoreline and to many clean, sandy beaches. Highway 325 continues a few miles past the lake to Rifle Falls, entering one of the long, winding valleys that characterize this part of Colorado. The other approach route is along 226 Rd from the east, starting at New Castle (exit 105 of I-70); this road follows Elk Creek valley, which is grassy, quite wide and flat-floored, bordered by wooded slopes that rise up 1,500 feet to the mesa top. Around the junction with CO 325, the surroundings are less developed as the land is BLM-owned, and the road passes several places suitable for free camping, along tracks leading towards the edge of the valley. Rifle Falls State Park is reached by a very short side road, and entrance ($7 per vehicle in 2014) is by the self-pay system since there is no permanent staffed visitor center - instead, the center at Rifle Gap serves both parks. The road passes the 13 site drive-in campground (another 7 sites are available for walk-in guests) and ends at a parking area for the two minute walk to the falls, and the longer (half mile), but still quite easy loop around them and the nearby caves. This is named the Coyote Trail; the only other paths in the park are the Squirrel Trail that parallels East Rifle Creek downstream, and the Bobcat Trail that also follows the creek, northwards, towards the nearby Rifle Falls State Fish Hatchery. Both these two are less than a mile long. 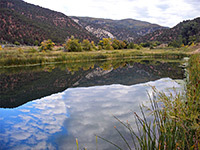 Visitors with a Colorado license may fish in the creek, which is home to cutthroat, rainbow and brown trout. The three part waterfall is an uncommon feature, and presents an impressive, almost tropical scene, as the waters tumble down on a boulder-filled area with pools, cascades and lush greenery, plus patches of more colorful red and yellow plants. Once the creek formed a sheet waterfall - many smaller falls cascading over a wider area, and the course of the stream has changed quite a lot over the millennia, as evidenced by the long wall of travertine (deposited limestone) that extends several hundred feet either side of the present day falls. 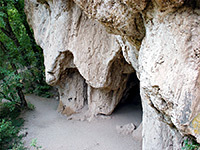 From the spray-drenched oasis beneath Rifle Falls, the Coyote Trail leads into the cottonwood and boxelder woodland along the base of the cliffs on the east side, passing the largest area of limestone formations, and the entrance to half a dozen caves. Some are very short but others go back 50 feet or more, far enough to become totally dark. They twist and turn, and the floor level changes, so both a flashlight and some care is needed if exploring. 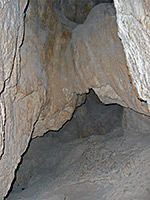 The ceilings and walls display rudimentary flow formations though the rocks have a dull brown color and the caves are not especially pretty. The path next climbs up to the top of the cliffs and cuts back west along the edge, past a calm, reflective pond (part of the fish hatchery), then enters a patch of trees enclosing the top of the waterfall, reaching several fence-protected viewpoints right next to the drop. A small hydroelectric generating station was installed here by the town of Rifle in 1910, and although long since disused, concrete foundations and rusty ironwork remain, including a pipe that diverts part of the flow, forming the middle component of the three falls - only the left and right channels are natural. The trail ends by descending a bushy hillside back to the start point, en route passing a spur path that leads to a sizeable alcove in the cliffs right behind the westernmost falls, and so providing quite a different perspective of the scene. The closest towns with hotels near Rifle Falls State Park are Silt (15 miles), New Castle (15 miles) and Rifle (13 miles) - follow the links for hotel descriptions and reservations.